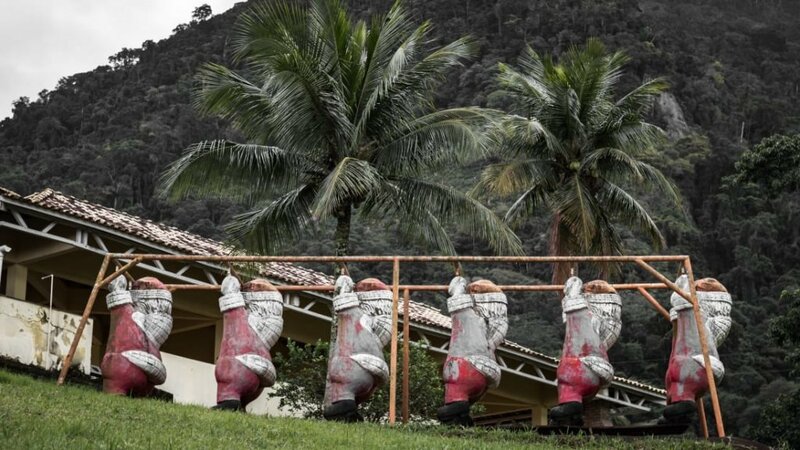 On your way to Rio de Janeiro, cruising through Brazil, you will spot a strange sight of Santas staring out at roadside. Their eyes lack luster, they stand in the cover of palm trees, surrounded by shrubs. Along with Father Christmas is the whole caboodle, strewn on grassy land. There’s Santa’s sleigh guarded and drawn to eternity by Rudolph and other reindeer. 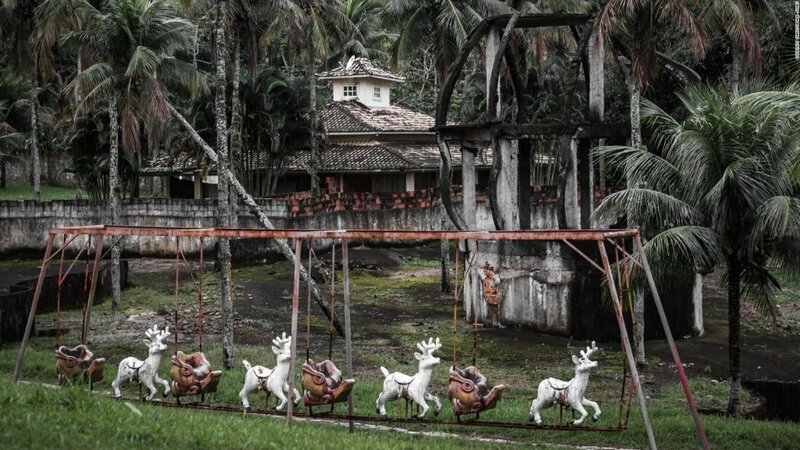 There’s a strange house in the middle, upturned, seemingly unsweet candy canes; children’s swings, rusty slides. This is Park Albanoel. You’re in Itaguai, Brazil. Long abandoned Christmas-themed park. 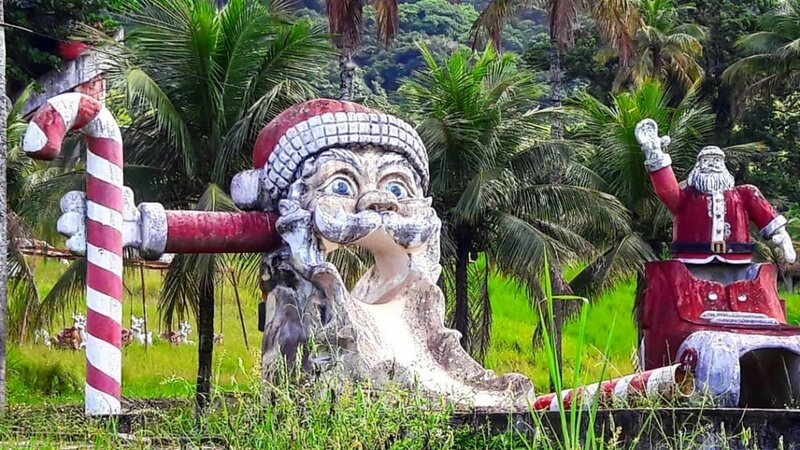 The park was conceptualized by Antonio Albano Reis, a politician whose trademark fashion was to dress up as Santa Claus every Christmas. People called Reis the Santa Claus of Quintino for that reason. He planned on building the park over 30 million sq. meters of land- a fantastic world of imagination for everyone to enjoy for all kinds of occasion. But this long-term dream was halted when Reis died in 2004 by road accident. Only the section devoted to Santa was finished and it would soon fall into decadence. 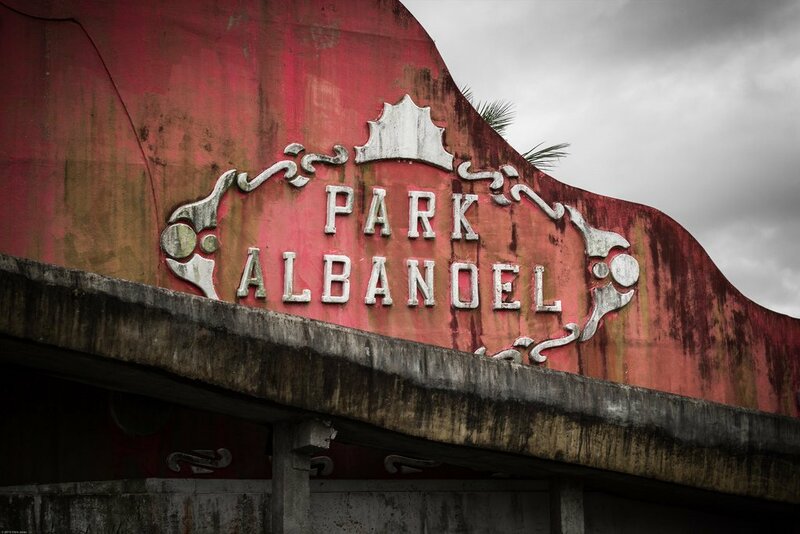 Christopher Jones, a British school teacher, was traveling through to Parati when the abandoned park came into view. He stopped by the road and, along with his friends, investigated the strange Santas that stood there and took pictures of them. A sharp photographer, Jones told CNN Travel of his odd experience, of him driving by the park several years since it was closed. He showed them snapshots of the place that captured its offbeat aura. The strange atmosphere of the park was inviting to Jones and his pals that they would start to explore the area. It had been there for years, Christmastime all throughout the seasons, unchanging, so their mirth had become sort of macabre; Santas laughingly endured decay, mocking. “[Christmas] is designed to be so happy, isn’t it? And joyful,” says Jones. “Yet these things are riddled with the cracks and mold.” Jones added. Christopher Jones was lucky to have a camera with him. He’s a hobbyist photographer and what he saw in Brazil he knew he couldn’t pass up to take pictures of. He explained how the whole environment plays to the park’s overall effect of strangeness. The steep valley behind, farther away a beautiful waterfall flows, and he had to work harder to get it all in the same picture.“The sort of Santa Claus in the — it almost looks burnt out helicopter — was a particularly surreal one,” Jones describes how certain settings stood out in the park and in his mind. Jones succeeded in taking photographs of the beautiful setting. He ventured into certain structures and shot rickety doorways, sad windows. The place has been totally abandoned, an air of dereliction hover in the midst of the place’s natural beauty. He saw broken Christmas statues, inside it are bits and pieces of cement and dirt, eerie guts of odds and ends. The group of travelers had wanted to walk farther beyond the Christmas park but were suddenly apprehensive. They thought about what could lay there waiting for them. “We didn’t want to get too far into the site, just in case. We stayed by the periphery, really, but who knows what else is in there?” Jones said. When Jones flew back home to the UK, he enhanced the pictures he had taken of the park. He boosted certain colors after desaturating the snapshots, and highlighted the place’s outlandish aura. He posted his work his Flicker page. People who have been drawn to it online are often hard pressed to find photographs of the abandoned park other than what Jones has shared. His images have been re-shared by high-profile social media accounts, and movie director Guillermo del Toro is one of those who have shared it through Twitter. Jones says that perhaps not much people know this eerie abandoned park even exists, and those who do have never been there themselves to actually take close up pictures of it. I The youngest person to have been elected president of the United States of America was President John F. Kennedy, who became president at 43. Although Teddy Roosevelt was 42 when he became president, he was not elected by the people. II President Rutherford Birchard Hayes had a condition called lyssophobia when he was younger, which is the fear of going insane. III The 4th of July is one of the saddest days for the United States of America, three presidents have died on this date. Thomas Jefferson died on the 4th of July in 1826, while John Adams died that very same day, just five hours after Jefferson. James Monroe died on July 4 in 1872. IV There quite a few talented Americans who are ambidextrous, and some who can even write with both hands simultaneously. However, there are only a few who can write two different languages with both hands simultaneously. James Garfield could write both Greek and Latin at the same time with both hands. Wow! V There was a day when President Teddy Roosevelt refused to shoot a small and cute bear cub while hunting. This was when the name Teddy Bear was created. It was created by the first Teddy Bear Company who got inspiration from the story when it was reported in the news. VI Quite a number of American Presidents have won international awards and recognition, but only a few of them have won the Nobel Peace Prize. The first person to win the Nobel Peace Prize was President Roosevelt.